Used as an ornamental grass in landscaping, as well as a feature in pots and containers, Miscanthus sinensis is a perennial deciduous grass with a number of cultivars. Just one of a valuable group of grasses from the genus. 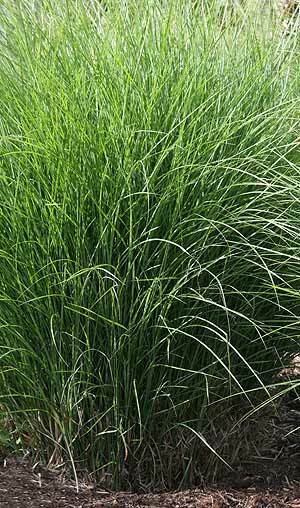 Also commonly known as Chinese Silver Grass as well as Maiden Grass. Some species and cultivars are also used in the perennial border, with species such as Miscanthus giganteus being evaluated as a source of bio fuel, Miscanthus may prove to be a valuable plant. Miscanthus sinensis Gracillimus (see picture right) is perhaps the best known and most widely used, a tight clump forming habit, green foliage and reaching around 2m it is one of the later flowering cultivars and thus the flower plumes last long into winter. A clump forming plant, maintenance is fairly simple, either at the beginning of winter or if you like the ornamental nature of the flower heads, at the end of winter, simply cut back to the ground. As a garden plant Miscanthus are fairly easy to grow. Try a sunny position. Miscanthus plants and species are used widely as an ornamental grass. 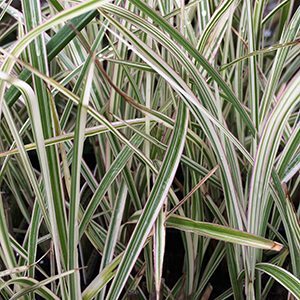 Species such as M. sinensis ‘Sarabande’, M. sinensis Variegatus (variegated maidengrass) and the striped form M. sinensis zebrinus are all popular ornamental plants. M. transmorrisonensis is an ornamental species reaching nearly 1m. A species that does well in heat and is regarded as drought tolerant. Narrow glossy foliage and taller yellow flower spikes from spring to summer.